Sambhav had glossophobia – which indicates fear of public speaking. Let alone a large crowd, the moment he saw a group of 5 unknown people, he would go numb and start fumbling with words. Even when he knew the subject very well, Sambhav would shiver at the thought of discussing it with someone or presenting it to a group. He was running into this issue quite often since he was in the first year BMS, and had to make individual/ group presentations every fortnight. He was in a shell until his 12th Standard, and managed to dodge the issue, but BMS was a course that demanded effective communication. He started falling ill and remained depressed, fearing the upcoming presentation/ group discussion. His best friend Raghav, who stayed in the same residential complex observed something was amiss and decided to interrogate the matter. He asked Sambhav various times as to what the issue was, but he just wouldn’t open up. One day Raghav confronted Sambhav and forced him to speak up. It was only then that Sambhav cried profusely and confessed his difficulty. Raghav decided to introduce Sambhav to his uncle Mr. Sharma, who was a personality development coach. For three months he underwent extensive training in speech therapy, voice modulation, corporate dressing and public speaking. Although the training helped Sambhav immensely, and improved his speaking ability, he was still unable to face a crowd. However, the good part was that Sambhav was determined to make efforts and overcome his shortcomings. As suggested by his sir, Sambhav prepared a 5 minute speech and read it out to Mr. Sharma daily for 10 consecutive days. On the 10th day, there was a marked improvement in Sambhav. For the next week, Sambhav prepared a 10 minutes speech, and read it out to Mr. Sharma and Raghav daily. Sambhav was initially reluctant, but started enjoying this process. Mr. Sharma then invited Sambhav’s and Raghav’s parents for them to witness a 20 minute presentation prepared by him. He was nervous during the first 5 minutes, but gained confidence with every passing minute thereafter. It was an achievement that Sambhav presented for 20 minutes at a stretch to an audience of six. For the next 2 months, Sambhav prepared various topics and practised presenting them to his friends and family. Sambhav soon became confident, and did very well in his college presentations in the 2nd and 3rd year of BMS, and was a class topper in both the years. What caused the magic? What did Sambhav do differently? He moved out of his Comfort Zone. A lad who was always terrorized of speaking in front of a crowd, started by making small presentations to a group of 2 known people. That was the first level of moving out of his comfort zone. With passage of time, this increased to 6 people, then 10 to 15 friends. 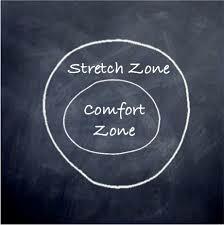 At each level Sambhav had to extend his boundaries, accept a new challenge and increase his comfort zone. His anxiety levels rose each time he presented to a larger audience. Sambhav continued this until he became one of the best presenters in class. Although people often refer to getting outside our ‘comfort zone’ in terms of trying fresh ideas, anything that raises our anxiety levels can be counted as being outside that zone. For instance, if swimming makes you anxious because you are scared of water, you’re not going to be comfortable in that situation. Although anxiety isn’t something we’re bound to go looking for, a little bit can be amazingly beneficial. We often need just a hint of anxiety to push us to get our work done, or to improve our performance. Of course, being willing to take a risk doesn’t mean everything we attempt will work out. But as every successful person would tell us, it’s only by being willing to make mistakes and trying something new that we can ever accomplish more than what’s been done before. “Nothing worthwhile has ever been accomplished with a guarantee of success.” – John F. Kennedy. 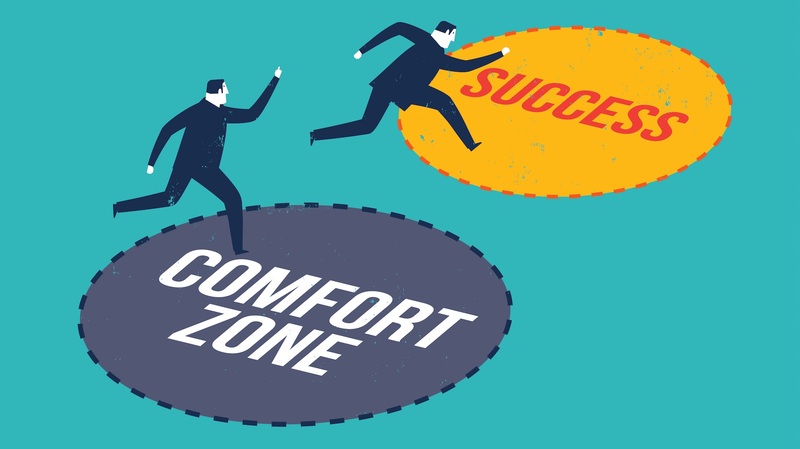 It’s interesting to note that Dr. Judith M Bardwick defines comfort zone as “a behavioural state where a person operates in an anxiety-neutral position.” Decades from now there would be people who would have achieved exceptional success. 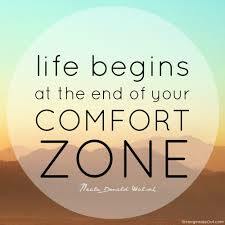 These won’t be people who have stayed inside their comfort zone. Rather, they would be those who have continued to stretch themselves, even when things were going smoothly, and who were willing to risk failure and looking foolish. If we can accept the truth about the world and ourselves, change whatever is holding us back, we’ll figure out that a single action lets us open the door of our self-imposed prison and walk free. In order to be more creative, we must try new things, see them in a new way, and then arrange the pieces together with a fresh perspective. This will gradually increase our comfort zone. There’s a spectacular world out there. We’ll see it, only if we try it! At times, you may slip, but that’s perfectly fine. In fact, that’s the only way one learns. At the end, even though you might feel helpless in situations outside your comfort zone, you have more power than you think. Hence, you must give it an attempt. You will surely be pleased at having given yourself the prospect to learn, grow and expand in your personal and professional arena. The question is – will you?! HR Professional with expertise in learning & development, employee engagement, counseling and training. Likes reading, music, blogging, gadgets and movies. Follows current affairs. This entry was posted in Self Improvement and tagged blogging, comfort zone, growth, life, management, personal development, photography, Self Improvement, success. Bookmark the permalink.